Friday The 13th fans have been enjoying the new Gun Media game for a few months now using the digital release that was launched in May. Although our readers are having a blast playing as the doomed counselors and Jason Voorhees, there are those gamers that have been yearning for more new content to interact with and experience while playing. Recently, Gun Media released an update to the game which brought smaller maps and new intros to the beginning of the game, but today a video was released announcing a new DLC. The video below announces the new Spring Break 1984 DLC which will be available soon to purchase at the Regular Price of $3.99 and an initial Limited Time 50% off price of $1.99. Details on purchasing will be available soon. 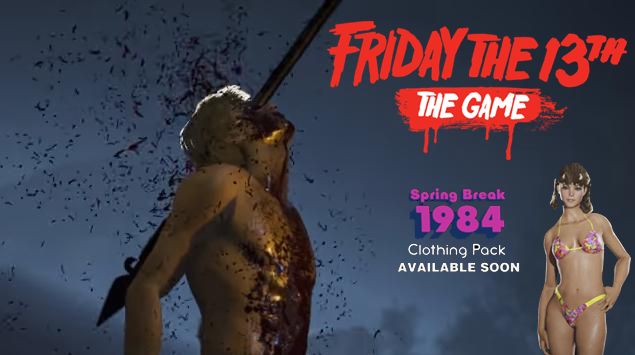 Watch counselor Chad show of the goods in his new "bathing suit" in the DLC trailer below and make sure to visit www.f13game.com for all things Friday The 13th: The Game!